After installation, you can manually move the files to a folder, and they’ll run just fine. I did this throughout the beta. However, when Office updates come out, things get weird. The update will probably work, but it will install a new copy of each updated app at the root of /Applications. You’ll then have to manually move these to your chosen location, overwriting the older original version. You then have to delete the updated app from the top level of /Applications. And basically, that’s a pain for a five-app bundle that gets a fair number of updates. 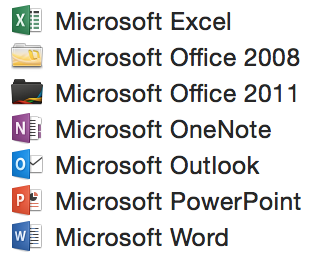 I created my new Microsoft Office 2016 folder in Finder. Then I used the Finder’s File > Make Alias command to create an alias to each of the five Office applications. I moved these aliases into the folder. The next step required both Terminal and root privileges, as the Office apps are installed with administrative restrictions. The first time you use sudo, you’ll be prompted for your admin password. What these commands do is set the invisible bit on each file, so they’ll no longer show up in Finder. They do show up in Terminal, and you can make them visible again in Finder by repeating the above commands, but replace the V with v.
Could you have tweaked the Office 2016 BOM in /Library/Receipts to relocate the .app files elsewhere in a way that would have survived updates?